Dip the rims of each mini Mason jar shot glass in honey, then dip in orange sprinkles to rim. Set aside. In a cocktail shaker, add fresh-squeezed orange juice, vodka, and triple sec with ice. Shake and strain into prepared shot glasses. Garnish with mini orange slices and mint leaves. Serve with straws. Enjoy! Additional supplies needed to serve as shown in picture: 6 mini Mason jar shot glasses, 3 paper straws cut in half. A perfect adult party shot for Easter, or any warm-weather gathering, inside or out! If you’ve never fallen in love with a cocktail, it’s likely because you’ve never made anything so teeny, weeny and adorable as these spiked Mini Orange Shots. Never much of a mimosa drinker, I wondered if making them with vodka and Mandarin (mini orange) juice would change my mind. Turns out, cocktails made with Mandarin-orange juice and citrus vodka is just about the best thing evrrrr. And that’s not the citrus vodka talking. Here’s how to make these wickedly sweet shots. Because, obviously. Now that you know they exist, you have to. Begin with a pack of mini Mason jar shot glasses. I was delighted to discover my local craft store sells packs of them for less than $10. Perfection! I’ll be using these babies a lot! Mini Mason jars are just too cute to boot! Rim each mini jar with a bit of honey and orange sugar crystals. It’s a pretty start to a durn pretty sip! Now grab that citrus vodka we talked about, a little triple sec, and fresh-squeeze yourself some mini oranges (like Cuties or Halos). Then cocktail shake it all together with a wee bit o’ ice. And pour away! 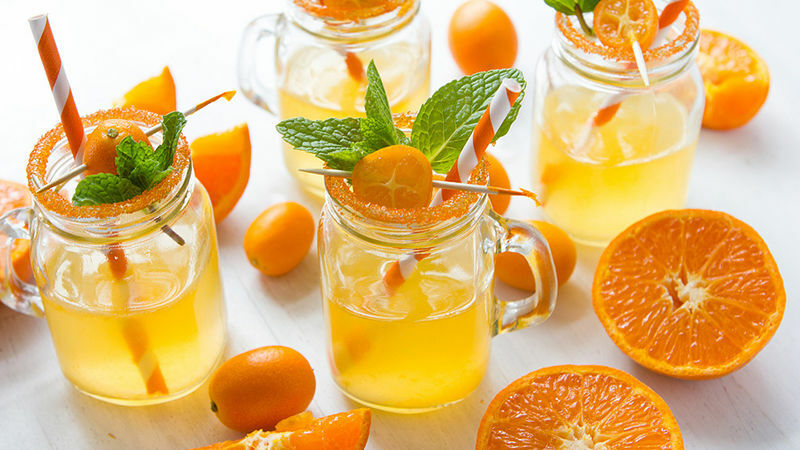 Add a quick garnish of mini-orange slices, mint leaves, and mini paper straws. These are the cutest little shots ever!